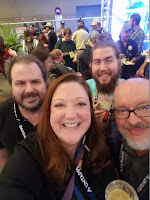 First published in Southern Brew News. Dictionary.com defines mead as "An alcoholic beverage made by fermenting honey and water," but to lovers of this often delicate and underappreciated elixir, mead represents much more. Mead may be the oldest alcoholic beverage, with some of the earliest documentation being around 8,000 years ago showing that mead has been brewed throughout the world. Until recently, mead has often been treated as an outsider to both the beer and wine communities, and many people say that it's a "love it or hate it" libation. 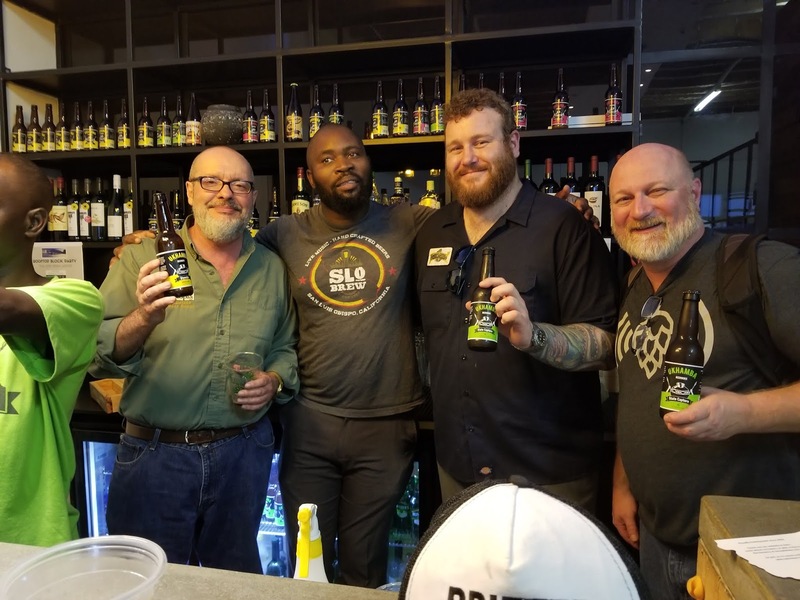 If you've not tried it lately, there are now several craft meaderies popping up around the Southeast that are producing remarkable meads with local flair. 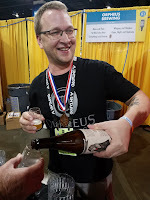 Monks Mead in Atlanta, Georgia makes a carbonated mead with wildflower honey that has a clean, sweet honey aroma and flavor that's not cloyingly sweet. The complexities are subtle, but flavors of pears and allspice can be detected. This is a pure, semi-sweet mead that's a good way to start your mead education. 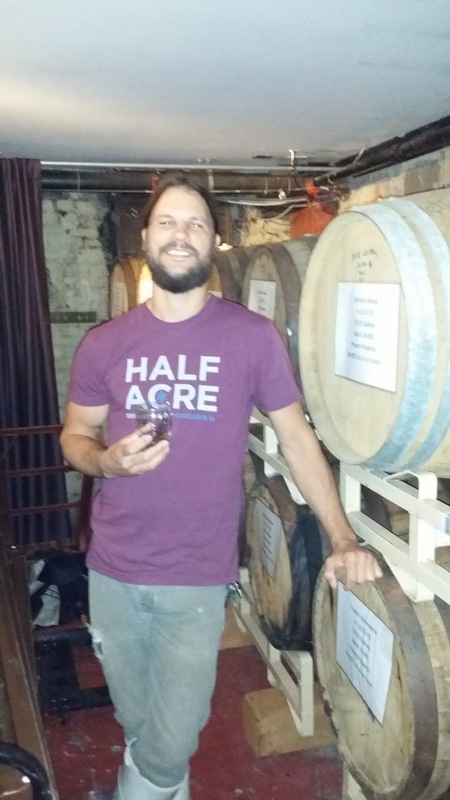 Justin Schoendorf, co-owner of Monks Mead, says, "We're Georgia’s first meadery - founded by two high school friends shortly after getting to Atlanta. We have one simple goal - create the best tasting mead in the world for everyone to enjoy - light, clean and carbonated with a touch of sweetness." 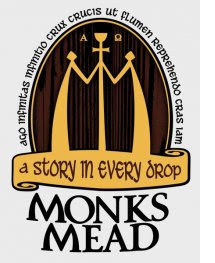 Monks Mead is looking to move to Athens and will be working with Brian Roth at Southern Brewing Company. 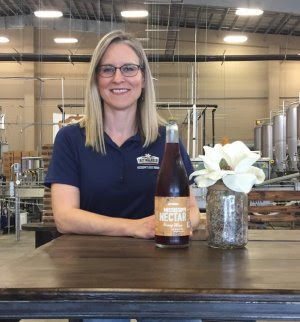 "Starrlight Mead has been making mead in Pittsboro, NC for six years with local North Carolina honey," notes co-owner Becky Starr. "We opened with only three flavors, and are now up to a lineup of about 25 that includes traditionals, fruit blends and herb-infused meads. We've won several awards at international competitions, including a best-in-class/double gold for our Semi-sweet Traditionalat the 2015 American Wine Society competition. Starrlight Mead is currently building the largest mead hall and production facility in North Carolina, scheduled to open in late 2017." Starrlight's traditional and popular Off-Dry Mead offers aromas and flavors of honey, butterscotch, clove, red apple, caramel, pear and kiwi. It's the perfect mead for those looking for something complex and a little less sweet. Fox Hill Meadery's Special Reserve Off-Dry Mead made with buckwheat honey and aged in oak showcases the brilliant color of dark rum and provides a similar flavor complexity. Dark fruits reminiscent of cherries and dates balance charmingly with vanilla and oak. It warms the throat with each swallow, leaving flavors of a strawberry/rhubarb pie in the finish. Fox Hill's Jason Russ remarks, "Our meadery was founded in 2007 and ranks as one of the oldest meaderies in the Southeast. We've been brewing mead, beer, wine and ciders since 1995 and we focus on making clean, balanced products. Fox Hill is a family run operation, with my wife Jennifer and daughter Abby helping out when things get really busy - like on bottling day." Still Pond Peach Mead is a still mead made in Arlington, Georgia at Still Pond Vineyard and Winery. Expect flavors of a Fuzzy Navel with a clean peach nose and flavor balanced with rich honey notes. The peach is so fresh in the flavor, that you can almost taste the skin. 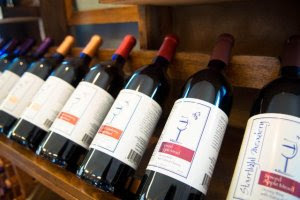 Still Pond offers tastings of their wines, meads and "Farmhouse Shines" in their tasting room. 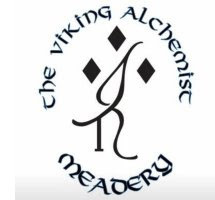 Viking Alchemy Meaderyis a family and veteran owned business located in Marietta, Georgia. According to Viking Alchemy's Tamara Kosoris, "Our passion for making mead started about 10 years ago in co-owner Brian’s kitchen. After learning about mead from a friend, Brian and his brewing buddy Nick decided to give it a shot, and this has led to a love of mead ever since. We opened our doors to the public on March 26, 2016 to a crowd of 350 people, and we have been growing our brands throughout the state of Georgia ever since." Viking Alchemy's Ethereal is made with peaches and presents intricate aromas and flavors. Semi-sweet with a slight acidity, this mead balances the flavors of honey with peach and almond-like peach pit nuances. Look for notes of honeysuckle and vanilla wafers, along with golden currant. Readers may know Lazy Magnolia Brewing for their craft beer, but the Mississippi brewery is now concocting meads too! Mississippi Nectar mead will have even the newest transplant to the South thinking of lazy summer nights with bees buzzing around. Using South Mississippi wildflower honey, this earthy, fruity balm will transport you to a rocking chair on the front porch surrounded by fragrant honeysuckle. It contains notes of blackberry, spices, pear and plum along with hints of Cheerwine. Leslie Henderson of Lazy Magnolia adds, "Mississippi does not allow breweries to sell product direct to customers. However, native wineries have no such limitations. The only stipulation is that 51% of the fermentable sugars must come from Mississippi. Honey was an obvious choice for us, and one of our relatives is a large-scale honey producer in Ellisville, Mississippi. We have used his honey in several of our beers, and we saw mead as a tasty way to increase awareness of this Mississippi agricultural product while expanding our own line-up. We also did this to highlight the absurdity of not allowing breweries to sell directly to customers who visit the tasting room. I can sell someone a case of 14% ABV wine, but not a case of 5% alcohol beer. In what universe does this make sense? Since 2012 we've sold thousands of bottles of wine to hundreds of happy customers, and not a single distributor or retailer has lost a penny as a result. We are now able to refute, with actual data, all of the arguments against on-site retail sale of beer." Cigar City Brewing in Tampa has also entered the mead making world, and their San Juan Hailmead takes creative inspiration from many of Cigar City's unique craft beers. Made with Brazilian pepper honey, pineapple, agave and habanero, this flavorful mead ranks as truly remarkable and memorable. Although peppers may not always fit everyone’s taste, the pleasing balance of hot and sweet notes in this mead reminds one of pepper jelly with undertones of fresh green pepper and mescal. 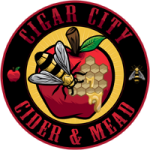 Cigar City Cider & Mead opened its doors in November of 2014 with Jared Gilbert as head cider and mead maker. Jared notes, "We want to offer our customers a diverse selection of 100% natural ciders and meads with Florida-grown ingredients - all crafted in the heart of historic Ybor City." 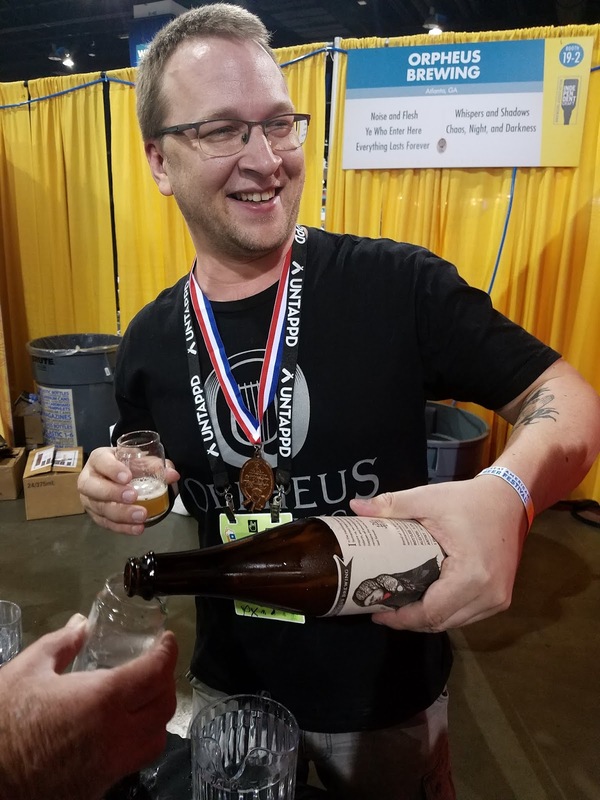 Jared has already won a variety of awards for many of his ciders and meads. Mead has inspired civilization throughout the centuries, and the enthusiasm for this tasty beverage is finding new fans every day. If you've never given it a go, check out some of the innovative meaderies around the Southeast or head to your favorite bottle shop or pub to delight your senses with one of the oldest alcoholic beverages in the world and discover how modern mead producers are adding their own "New World" spin. 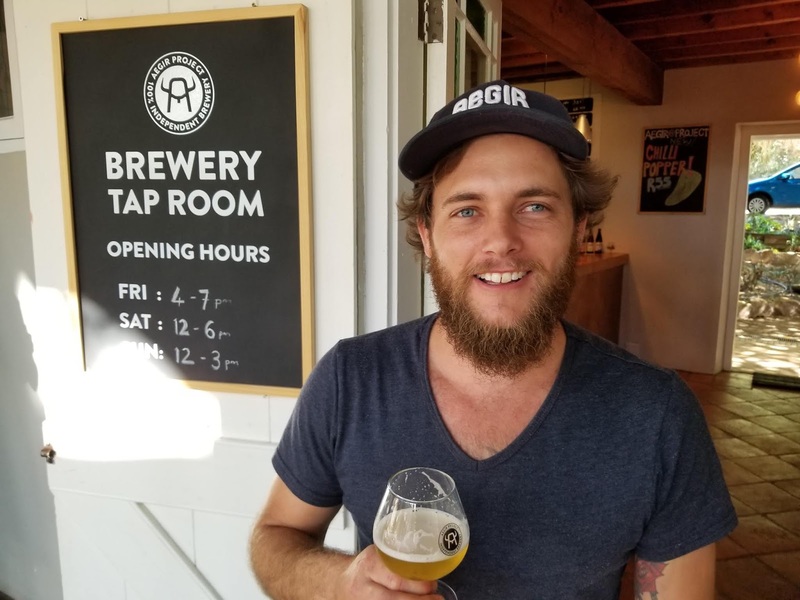 In the craft beer world, cider is still often considered a disruptive interloper at worst and a drink for people who don't like beer at best. 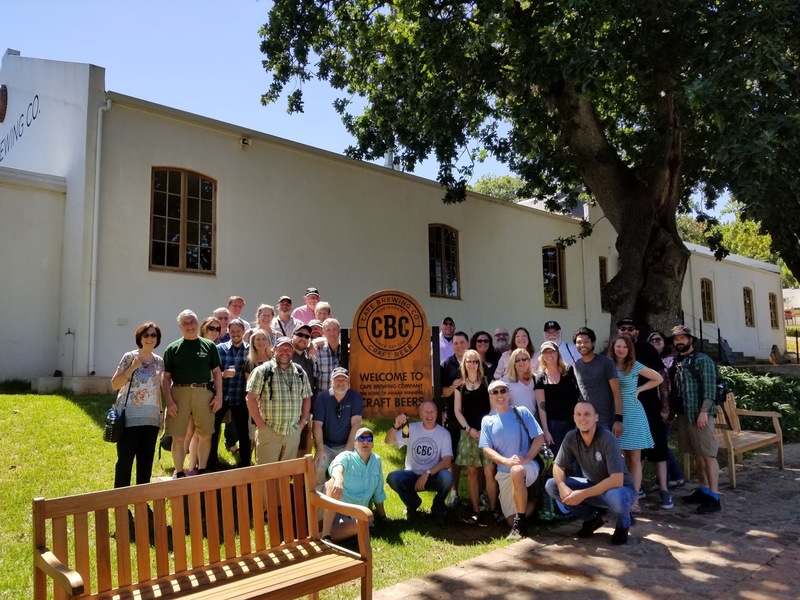 If your only experience with cider are some of the mass produced, soda-pop, and one-dimensional ciders most often seen in the market, then I can understand that point of view. However, cider is an old tradition in other parts of the world where the product is complex and interesting and very tasty. It is a tradition that is slowly making its way to the U.S.
My first introduction to cider which drinks well on its own and pairs well with food ( outside of my own home brew) was in England when I tried cask ciders for the first time. They tasted closer to the ones I made at home, and I knew that there were more like them. My second taste of well-crafted cider came at one of my local watering holes where I tried Etienne Dupont a product of Normandy, France. It is slightly sweet but with beautiful floral notes, earthy qualities, and a great balance of apple in the nose and in the aftertaste. Normandy, France carries a strong tradition of cider-making that goes back centuries. Although, for most people, the WWII D-Day invasion is the first thing that come to mine when they think of Normandy and for good reason, there are other reasons to visit this area. After reliving history, marveling over the effort that went into saving the world from disaster, and shedding a tear or two over the individual sacrifices made, a person really could use a drink. What better than immersing yourself in a a piece of history that is also very tasty. Most of the cideries are on small working farms while others are much simpler operations. 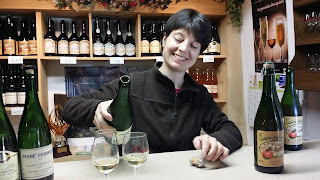 Every cidery we visited had a dry (brut) a semi-sweet (demi sec) or a sweet. They also all made Calvados (distilled apple juice) and Pommeau (Calvados mixed with apples juice consumed as a sweet apertif). Although we tasted many wonderful ciders, the family making some of the most innovative and flavorful ciders is Famille Dupont which has been on the same site wince 1887. We had the the good fortune of having fourth generation owner, Jerome Dupont, give us a private tour and tasting. According to Jerome, cider is still, for some, a peasant drink. 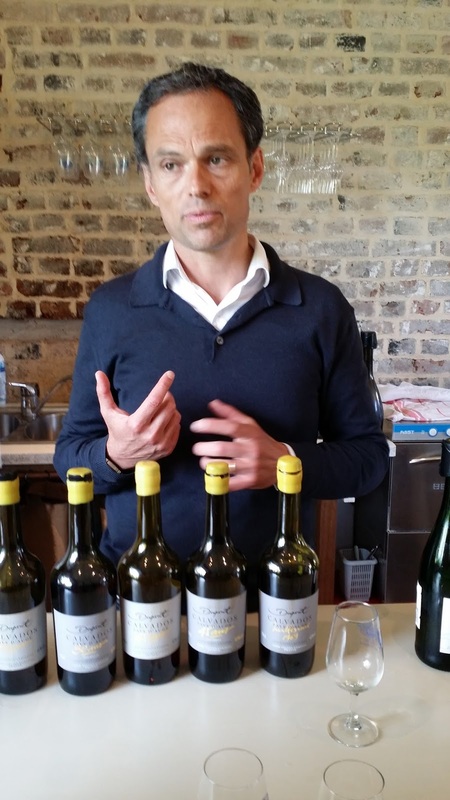 Most French prefer the wine for which the country is very well known, but people are slowly discovering this craft tradition, and Dupont is delivering. Dupont is one of the very few cider makers actually well-distributed in the U.S, so, yes, you should be able to find some of their products if the distributors in your area carry them, and the labels are a bit different in the U.S. Although, I believe they are in the process of making them all more uniform. They are imported by B. United International, Inc. With their importers encouragement, Dupont has expanded their line of ciders beyond the typical three. Although most ciders are a blend of sweet, tart, and bitter apples, Dupont has worked on special blends and even using the tart and bitter apples on their own. One of my favorites, Cidre Triple, is made with only bitter apples. It mimics some of the flavors of a floral, hopped beer. 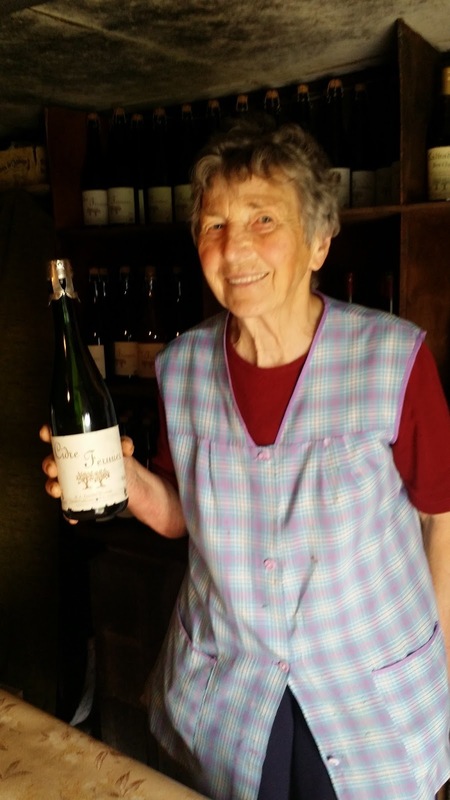 Their classic cider, Cidre Buche, is sold under the label of Etienne Dupont in the U.S., and named after Jerome's father whom we were delighted to meet on our tour. Etienne still oversees the making of the Calvados since the distilling process is an art form in itself. Another favorite of mine was their Reserve which is aged for six months in Calvados barrels. These ciders are flavorful, complex with a range from dry to sweet. The care in the apple choices and flavors show in the final products. Making cider requires as much agricultural knowledge as it is a brewing craft. We saw a new field of apples trees. 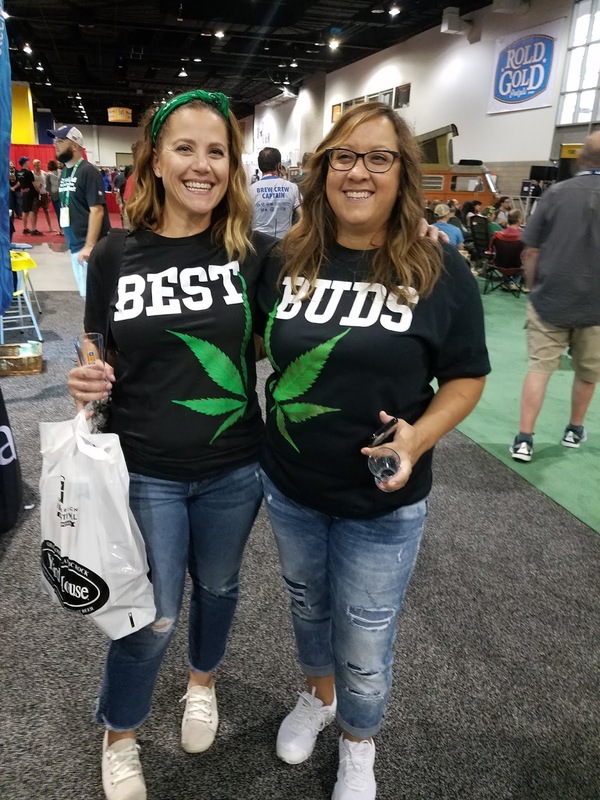 They were ordered from the grower two years prior. 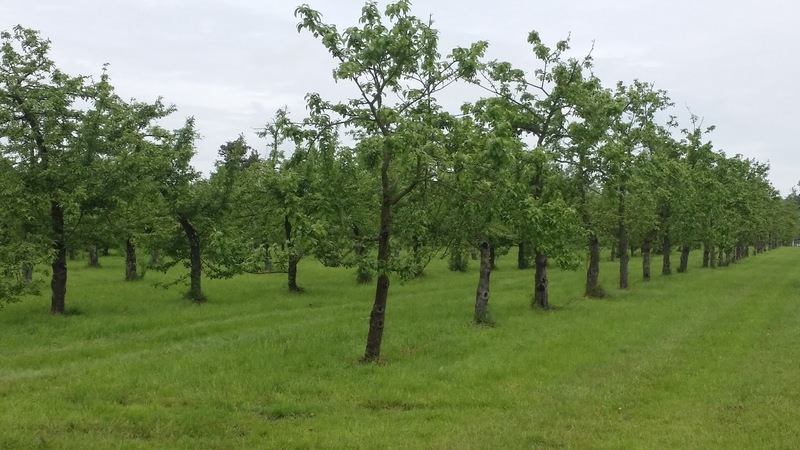 Once the saplings reach two years they are delivered and planted, but it will be three more years before they produce apples. And although some cideries grown some and use outside sources for apples, Dupont grows acres of apple trees for their ciders. The fermentation of the cider starts with the natural organisms in the fresh pressed juice (wild fermentation). Most cideries leave it at that. Dupont starts all of their ciders out this way, but have isolated certain strains in yeasts for the flavors that they want which are introduced later in the process depending on the cider. They also use epoxy fermenters with movable lids to control oxidation in the different stages of fermentation. They are dedicated and passionate about making a delicious product. 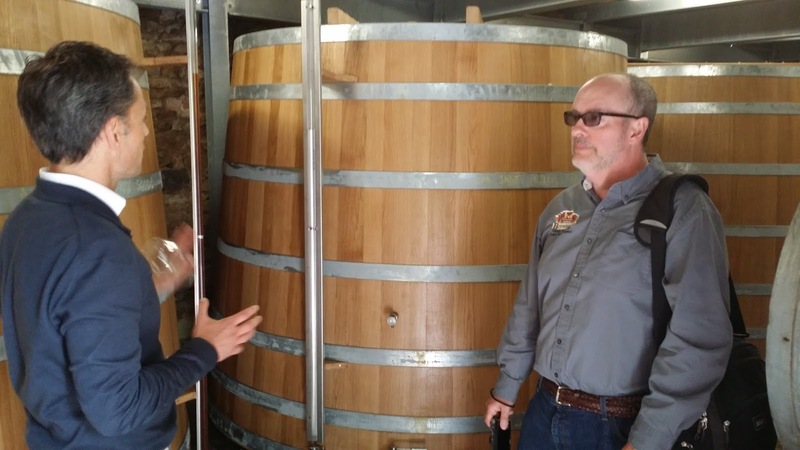 Much like the craft beer community, the cider makers work together, Dupont is part of an association of growers that share equipment from apple pickers to sorters due the cost being so high. 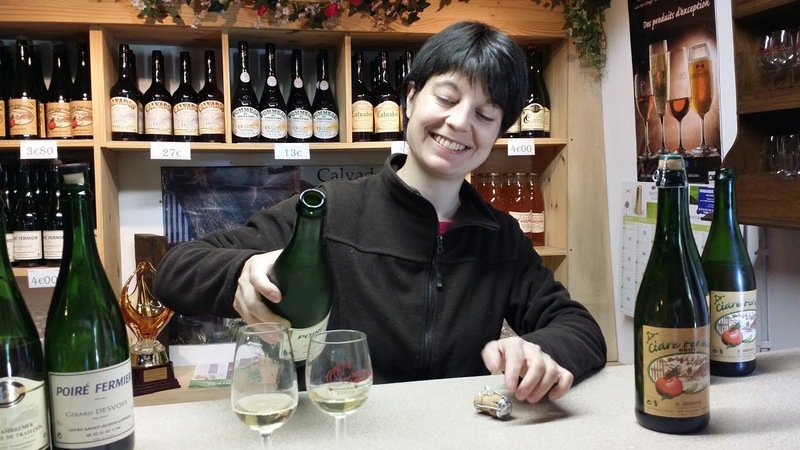 In the restaurants around Normandy, you can usually find at least one cider on draft and in bottles, both small bottles and Champagne style at very affordable rates. The flavors pair incredibly well with food, and there is even cider cuisine. I have plans to recreate some of the dishes here at home. I will let you know how it goes. Jerome in front of one of his orchards. The countryside of France is spectacular, and the discoveries you can make are immense. 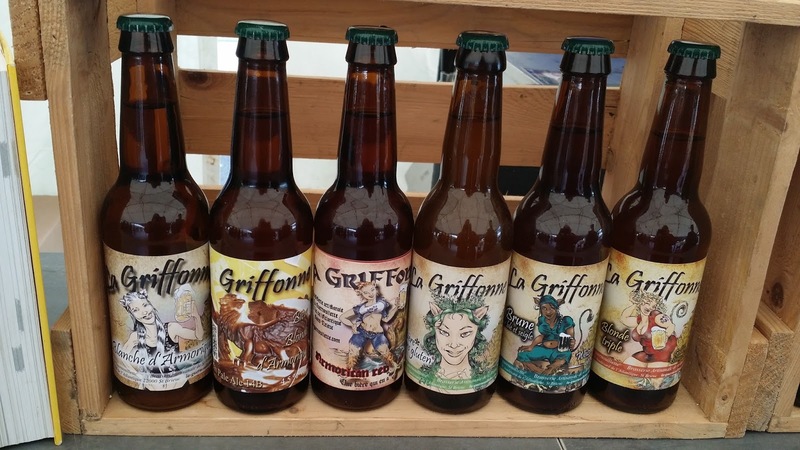 If you can't make it France, look for some French ciders in your area. 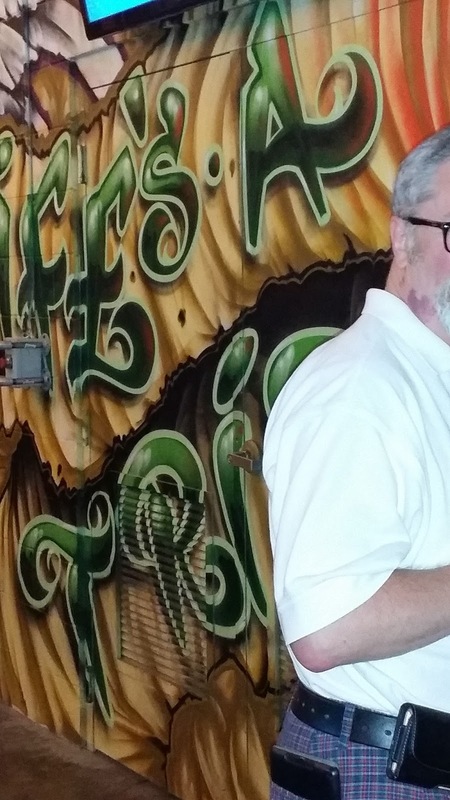 If you have a local cider maker, support them even if it is outside your comfort zone. You have only deliciousness in your future. As always, eat well and drink good...cider. France has earned this reputation. 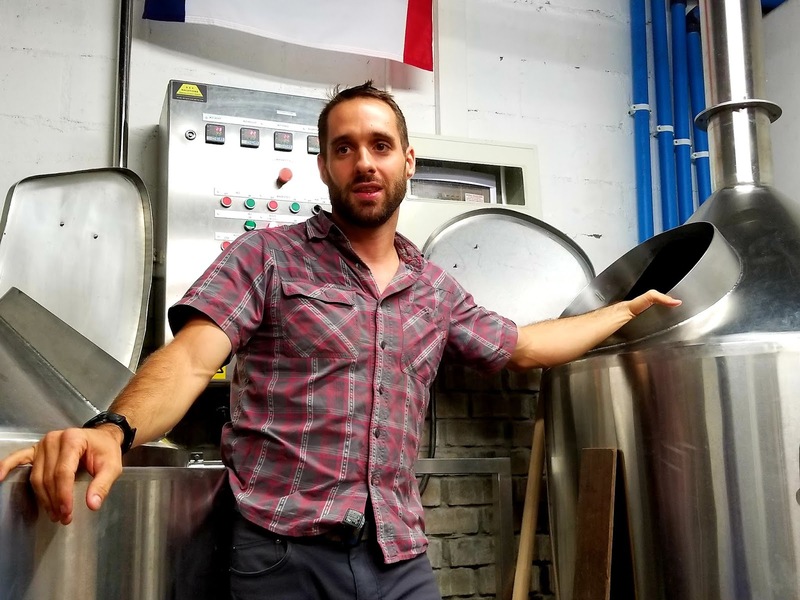 Wine remains currently the most popular beverage for many French citizens and travelers who visit the country; however, there is a craft beer revolution quietly making its mark. Years ago on a trip to Paris, the only beers we could find were some Bier de Gardes and Belgians. Times have changed. beer journey. We found quite a few Belgium beers still, but at a cute little cellar bar, Les Fleurs du Malt, we found beers from a couple of craft breweries that are doing some interesting things including smoked porters and sours. The focus of the beer portion of our trip was actually Brittany, but before we hit our destination, we made a stop along the way at Brasserie Artisanale du Bouffay. 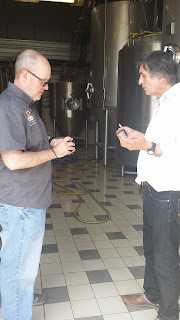 We were charmed by Pierre, the owner, who is a former farmer and passionate brewer of beer. He started as a home brewer - not a unique tale - and moved on to commercial production. He believes in making beer that he loves to drink, and having tried his organic blond and tripel at the brewery, he is doing pretty well. According to Pierre, there are approximately 600 registered craft brewers in France. The trick here though, according to another source, if you want to brew beer (home brew or commercial) you have to register. 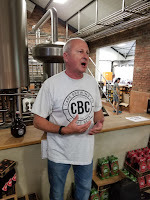 So many of the registered brewers are not making a living at brewing; although many sell out of their garages and at markets. Pierre sells his beer at the brewery and through a distributor as well. He also has a contract with some Whole Foods in the U.S.
Having begun our journey into French beer, we moved to our first destination, Brittany. There is so much ground to cover that the best thing to do is find a central point to make home base and travel out from there. Of course, you need a rental car for this, but there are many things you could not see otherwise. We chose Huelgoat as our base of operations. Huelgoat is an adorable town with a large English population and tons of hiking trails for working off all the food and beer. 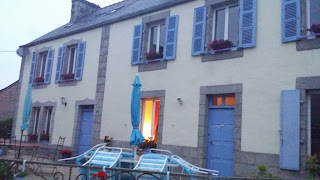 We stayed at a cute little B&B called Laura's Chambres d'hotes. Although we found many wonderful bars and pubs to sample French craft brews, the best beer part of this trip was a beer festival. Yep, you read it correctly. 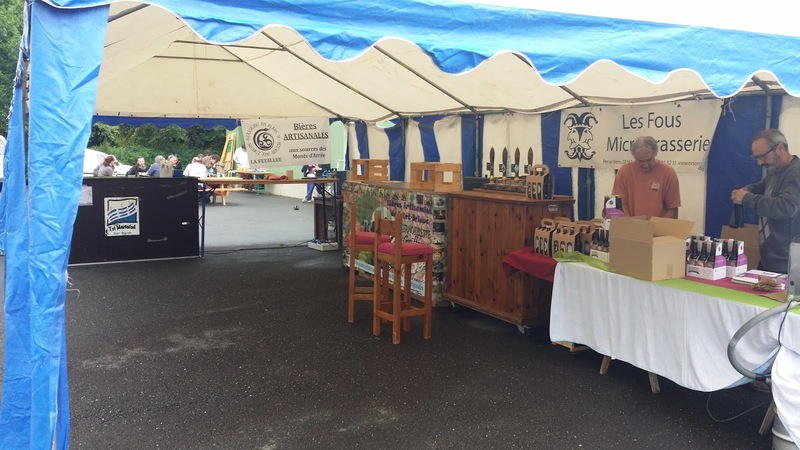 We found a beer festival in Brittany, France. 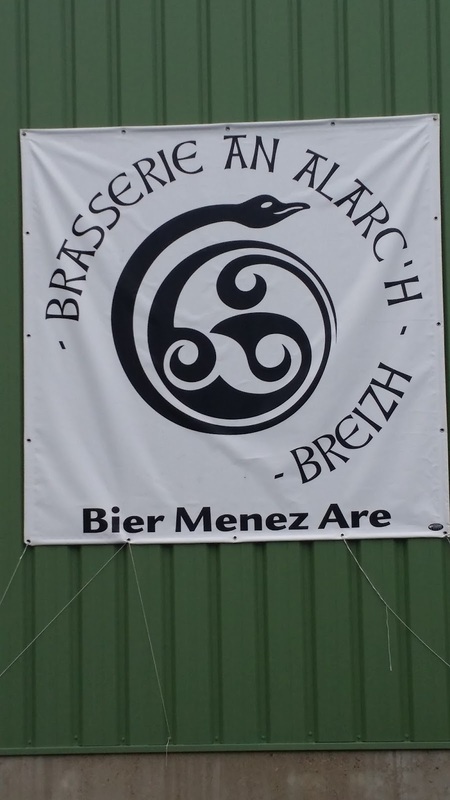 It was hosted by Brasserie An Alarc'H and set up somewhat differently than our fests in the states. There was no entry fee. Breweries brought drafts and bottles. You paid 2 Euro for a a sample glass and could sample whatever the breweries at brought, but you could also pay for full pours and buy bottles of beer to take home. The variety was fairly impressive. The hosting brewery's beers, one of which was infused with ginger, were quite tasty, and there was even a real ale brewery serving beer out of casks, Les Fous Microbrasserie, which we actually visited the day before. It is on a farm in the middle of the Brittany countryside run by a husband and wife team, Don and Trisha. Another favorite brewery of mine had a bit of a heavy metal set up with a dry-hopped pale ale that was exceptional, Couille de Loup. 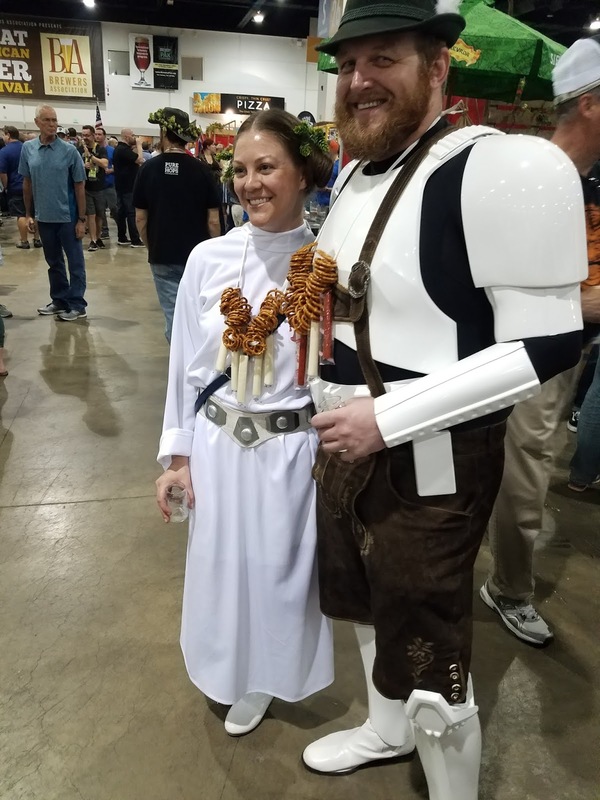 Although, all of the breweries had some basic styles most of the did, including blondes, ambers, browns, etc, some did branch out with Belgian whites, alt beers, and fruit and spice flavors. The festival even included a food truck and the first organic toilette I have ever seen which used cedar mulch instead of chemicals. Brittany itself is a beautiful region with coastal towns and inland farms. The people are friendly, and the food is delicious! In fact, some of the best seafood I have ever had, I found on this trip. If you are interested on more details or want to plan a trip yourself, contact me with questions. I could write pages on this region alone. 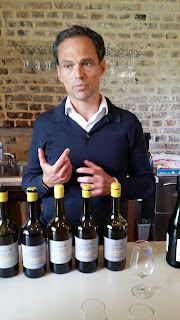 Part II of this article will focus on the ciders of Normandy! In the meantime, remember to eat well and drink good beer. Aaron Deist showing off the barrel room. 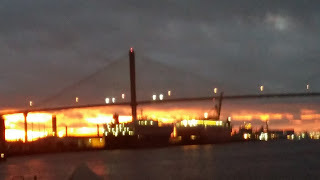 What comes to mind when you think of Savannah, Georgia? Do you envision beautiful trees filled with Spanish moss, amazing architecture, River Street, or a certain book/movie set in one of the most gorgeous cities in the state? To be honest, I see all of those things and more. I love strolling through Bonaventure Cemetery, people watching as I walk through the squares, eating steamed oysters, listening to music at Kevin Barry's, and enjoying some local craft beer. Yes, that's right. 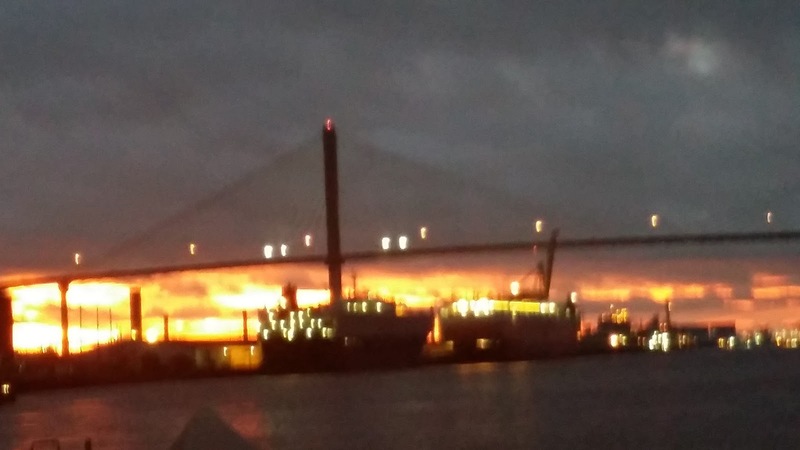 The craft beer scene in Savannah gives you one more reason to visit that magical town on the river. A friend of mine and I recently took a girls' trip to start off the summer and visit some of the awesome breweries in town. We started the beer portion of our trip at Moon River Brewing Company. Moon River opened its doors in 1999, so it is the original craft beer destination in Savannah. Still brewing fun and tasty beverages, this brewpub is a great place to grab a bite to eat and soak in some local flavor. With great brews like Swamp Fox IPA, Da Bomb dry Irish stout, and Wild Wacky Wit, you can not go wrong. We had the luck to run into one of the owners, John Pinkerton, and head brewer, Aaron Deist who honored us by taking us on a tour of their barrel room and giving us samples of a few new beers in the making. I do declare, it was the tastiest start to a great trip. Get down there soon, as a marvelous Berliner Weiss will be going on in a couple of weeks. With a beer to go, we bid the folks at Moon River a thankful farewell and headed for our next adventure. About three miles out of town (and totally worth the Uber fare), sits Coastal Empire Beer Company. Spearheaded by brothers, Kevin and Chris Haborak, Coastal Empire is the epitome of a local, small craft brewery. Because the facility is tucked away in an industrial park, you may think you have gone to the wrong place, but don't turn away. 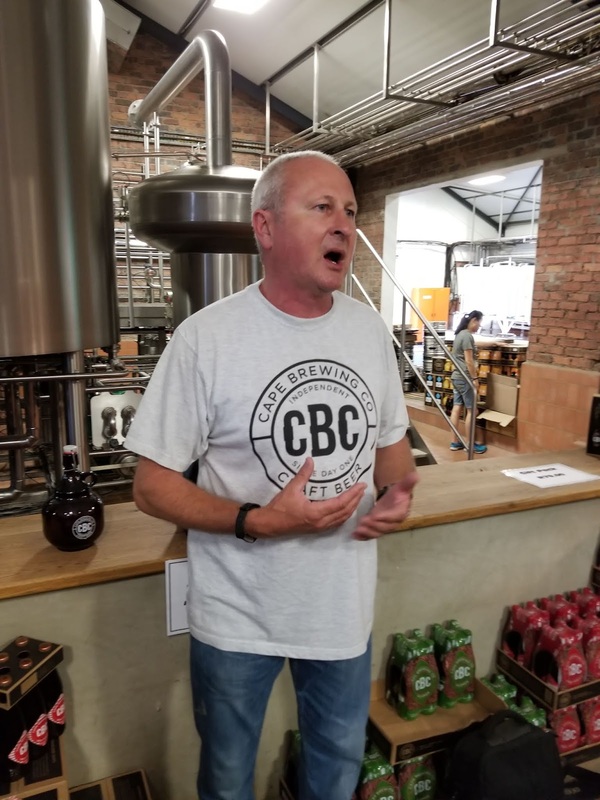 Inside their brewing space, these guys have plenty of room to grow and a tasting room for you to sate your thirst while learning about their brews. There is literally something for everyone from their Tybee Blond to the red wine barrel-aged Midnight in the Garden. You will enjoy choosing your next taste. Thank you Kevin for introducing me to "Pink, Fluffy Unicorn." Next time you are in town, go show these guys some love. After closing down the tasting room, we decided dinner was in order as well as a round or two of Irish music. 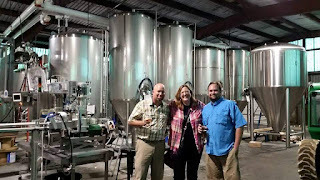 Kevin and Chris give the Beer Wench a tour of their magic making facility. Cheers, guys! In our wanderings, we found a few surprises not totally beer related. At the Savannah Bee Company, you can taste a flight of mead, the oldest fermented beverage in the world. If you are more into wine than beer, you can taste a flight of Georgia wines in the cellar of The Salt Table. We also enjoyed barley's other incarnation with a tasting flight of single malt Scotch at Molly McPherson's which also boasts a good craft beer list as well. After a day of sightseeing and various other tastings, we wandered down River Street to Service Brewing Company which was a perfect spot to check out on Memorial Day weekend. 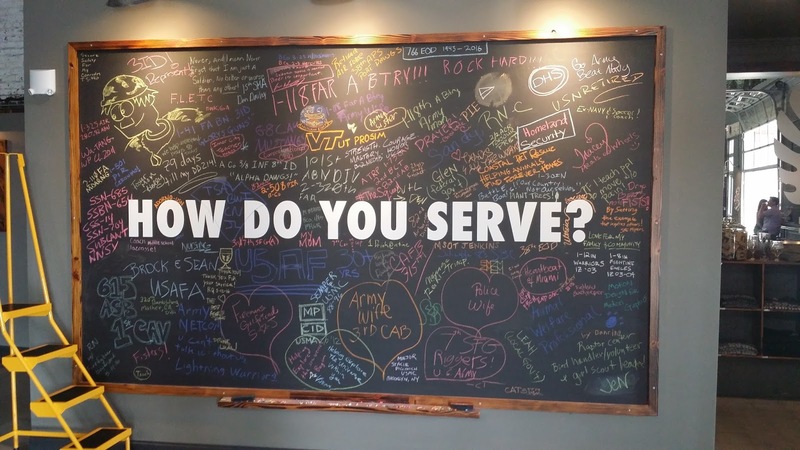 Owners, Kevin Ryan and Meredith Sutton hold a special place in their hearts and brewery for our service men and women. Their pride shows in the brewery's American flag painted as a back drop for to the music stage and the service patch art installations. The names of the brews also show the respect and love given to those who serve. My two favorites were Battlewagon (an imperial IPA) and Old Guard (a bier de garde using Savannah Bee Company honey). Meredith gave us an incredible tour, introducing us to her bees which provide honey for some of their brews. 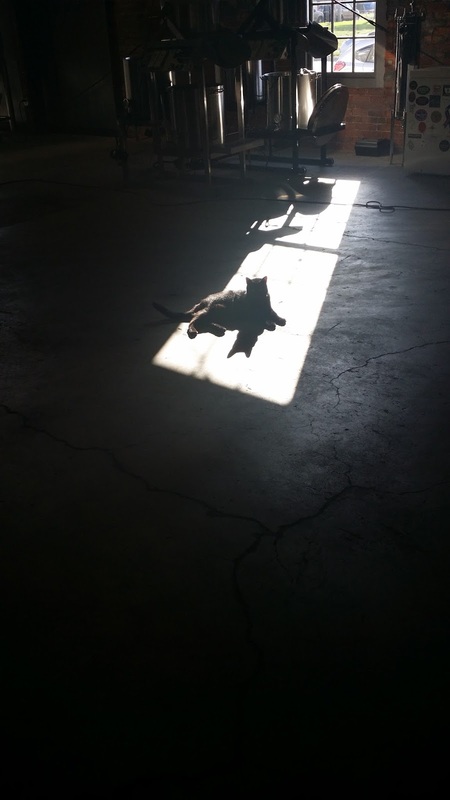 We also met brewery cats Blackhawk and Chinook, who keep watch over the entire operation. 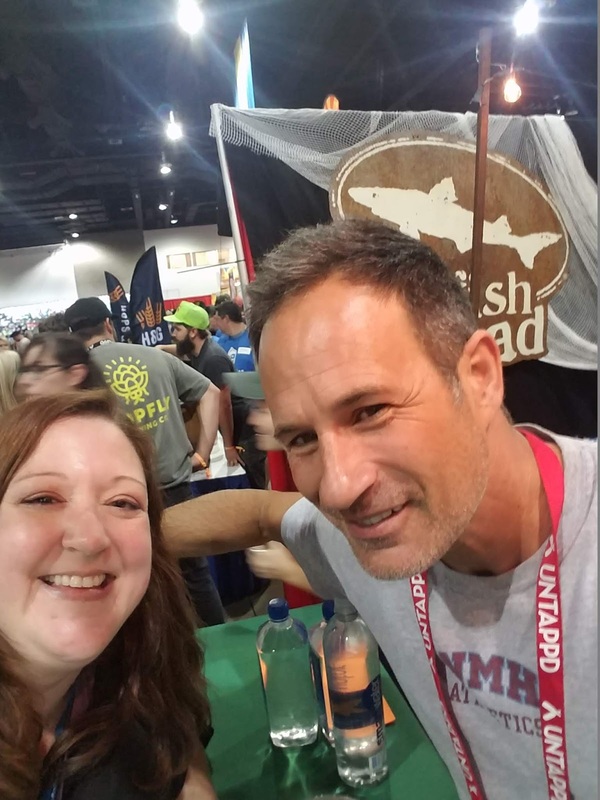 This is a couple who believe in hard work, community, putting out quality products, and honoring those who work to allow us to enjoy a good brew with friends. When you think that the end is near, do a double take. 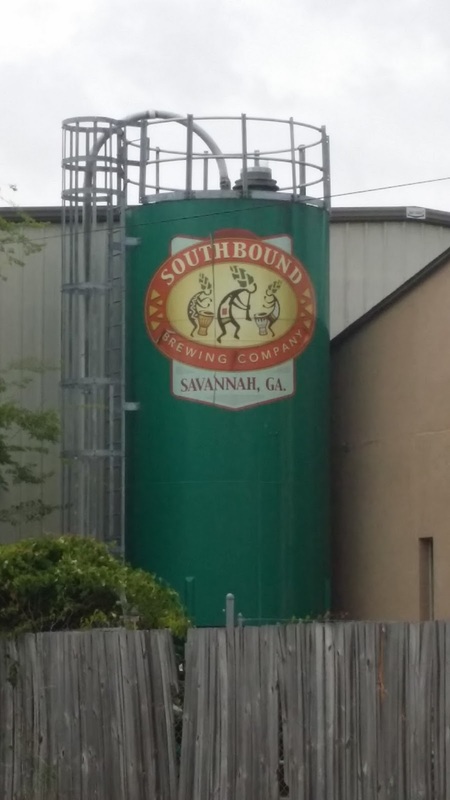 There is yet another brewery on the mission to keep Savannah from being thirsty for good beer. 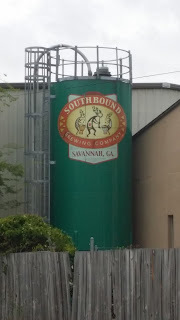 Southbound's theme is music, and they use hop head Kokopelli figures as their logo and beer names that honor songs and musicians like Hoplin, an homage to the late Janis Joplin, and Roxanne, a sour cherry ale. She may not need to put on her red dress but she does wear it well. Food truck outside...good beer inside...what else do you need? Thanks to out to Carly for setting us up and to Natalie for being such a great hostess. 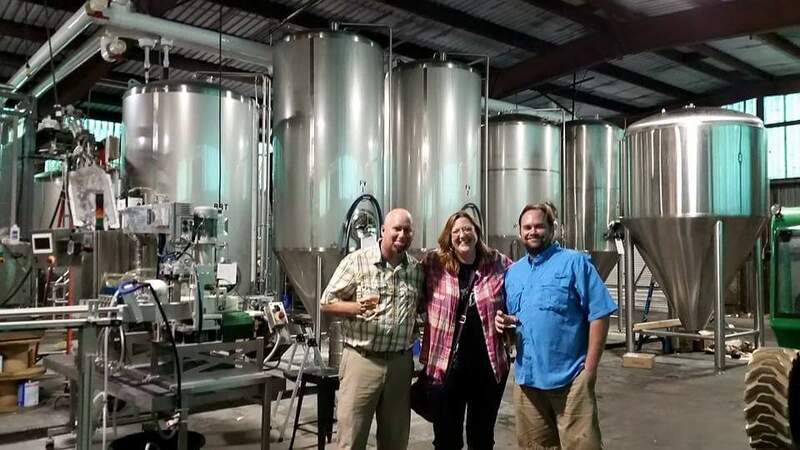 If you do all the brewery tours and are still thirsty for good brews, there are several great venues for local, national and international beer including Crystal Beer Parlor, The Distillery, Savannah Taphouse and more. I have to count this girls' trip an absolute success and can not wait to go back to one of my favorite beer-cation spots. 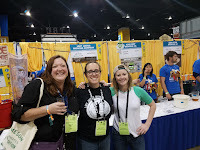 On a final note, I had planned to write this article as a counter to the recent piece about a brewery brewing beer for women, but as I talked to everyone including women, like myself, enjoying good beer, I realized that there was no point. If you make good beer, people will drink it - male or female. Most beer industry folks know this. To condescend that women have to have special beer made for them or marketed to them is ridiculous. This beer woman has been enjoying craft beer since 1993 when I was introduced to beer with flavor and different styles. Whether you are man or woman or somewhere in between, you can find great beer. The beer community is as diverse and flavorful as the multitude of styles brewers can imagine. 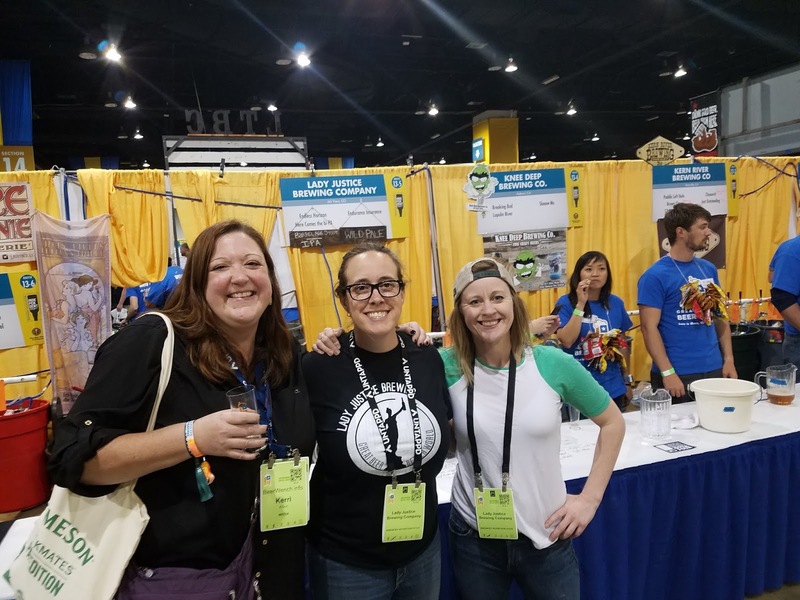 Cheers to all the ladies that I met in the research for this article and the breweries who welcomed us with open arms to share their hard work and dedication. Remember, eat well and drink good beer.